Prior to Anzac Day Chris had two Saddle Sore 1600km rides under his belt (that's 1,600km in 24 hours for those not familiar with the IBA's lingo) and on Anzac Day he was after number three. In fact it wasn't an ordinary SS1600 either - the one he was chasing is a special Anzac Day version open only to Aussies and Kiwis. Chris gave me a ring when he hit Paraparam and gave me an ETA into Ashhurst of 20:30. That sounded about right to me so at around 8 I saddled up, picked up some fuel and then rode out to Ashhurst to wait for him. About 5 minutes later I finally spotted an array of lights coming my way and managed to get that first picture of Chris arriving. We quickly made our introductions and then Chris got stuck into fuelling his bike, taking the required photos and completing his all important paperwork. Once I'd taken a few pics I hurriedly put away my camera and got my gear on. I didn't want to hold up Chris too much - he still had 500km to go. We departed Ashhurst and I led Chris over through Colyton to Cheltenham and then onto Vinegar Hill. While we were riding Chris called me on the phone and we spent a lot of the ride chatting away about endurance riding and funnily enough motorcycles...The phone cut out reasonably often but it was quite neat being able to chat to Chris while enjoying a really pleasant ride. We got to talking about lights too and just past Rewa Chris passed me so he could show off his setup (more details about it on his blog) and I just tucked in behind for the rest of the ride to the main road. At the main road we quickly said goodbye and Chris headed North towards the completion of his SS1600. The next day saw confirmation that Chris made it home with time to spare and hopefully all the paperwork he needs to get his certificate - well done Chris! Oh, and I think there might just be a challenge in order eh Chillertek? Yesterday was Anzac Day, the day Kiwis and Ozzies remember our veterans and war casualties. It is a public holiday but a greater and greater number of people are attending services all over the country to commemorate the terrible sacrifice that has been made so that we may enjoy the lifestyle we do. 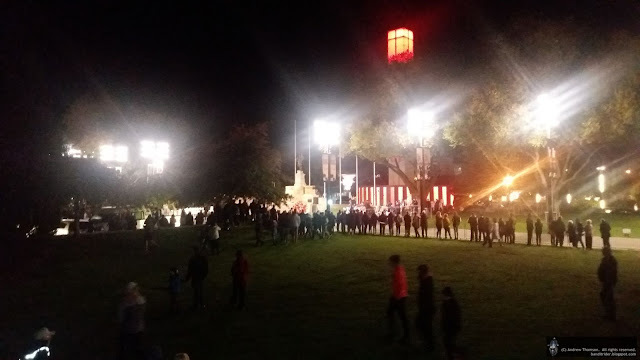 I attended the Dawn Parade here in Palmy and it was very well attended and was a great service. I particularly enjoyed the way a high school student spoke of his ancestors who had fought and suffered in the two world wars. I was also shocked to learn that Palmerston North's deaths in WW1 alone were a staggering 800 from a population that was then only 12,000 - one can only imagine the effect that had on the community. The heavy weight and lack of engine braking is fairly hard on the pads and the old ones were well and truly shot. While I was working on the bike I kept an eye on the time and an ear out for the arrival of our local Spitfire - it along with 2 of the air force's Texan trainers were programmed to fly over a number of the local war memorials as part of the Anzac day activities. Here's what they really look like (and a chance to show off some of my favourite photos from the 2013 Wings Over Wairarapa). So where was I? Oh, that's right, we'd just popped out of tunnel 2 or 4 and it was time to head for Whangamomona for a late lunch. But first there was a little more gravel on Junction Road to get us back onto the Forgotten Highway. Our last little bit of excitement was the Whanga Saddle and all its neat twists and turns before dropping back down into Whanga itself. As per usual on a weekend we weren't the only bikes there, two filthy trail bikes and an even filthier 1190 were parked up having found some even more interesting scary roads. It took quite a while to get the tribe fed so there was plenty of time for the telling of tall tales and while we were there the heavens really opened up helped me make the decision to put my wets back on for the rest of the afternoon. We finally got back underway sometime around 3 and next up was the familiar tunnel on the main road itself - I wonder how many times I've ridden it now? Next up we had a fairly long stint towards Kiwi Road. 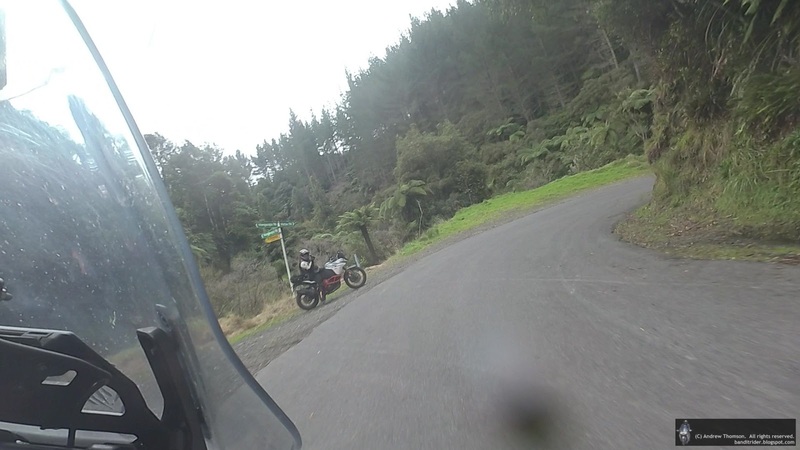 One part I really liked was the drop down Okau Road following Reuben on his KTM Supertanker (45L onboard!). Next up was the scramble up Kiwi Road to Tunnel number 5. Having done this on the last tunnel tour with the BRR I knew what to expect - narrow, twisty, rough and tricky work. It was slow going in places with 2nd gear most of the time and even first a couple of times. The Tenere got a bit hot and bothered but seemed to handle everything pretty well - I reckon that even though she's heavier than the Vee, she is the better bike in all situations. At the bottom of the hill we stopped and then started separating as people either made their way to petrol, motels or in my case home. I turned off onto 3A and aimed for Inglewood for my top up but when I hit Inglewood there wasn't a station on the South side of town so I carried on under skies that were starting to look fairly dark and ominous. By the time I hit Stratford the sky was really black and I managed to squeeze in just over 20L (so theoretically nearly 3L to spare) for the 378km the bike had done - not too shabby. I also popped on my Goretex gloves and then hit the road. As it happened I managed to avoid any real rain only had a few spits coming into Palmy. It was quite a good and quick (5.5L/100km) trip back and I got to enjoy my Denali's and their motorist zapping potential a few times too. I rocked up home a smidgen before 8pm and in this order: lit the fire, had a hot shower and then fed my worms - what a great day out on the bike. So, a big thanks to Phil for organising the ride and leading us around all over the 'naki in search of holes through the rock - it's a cracker route and one I'll be keen to do again sometime. My GPS decided not to record any tracks for 90% of the day so the map below was created from Phil's GPS route that he sent out and I don't think that we deviated from it. The Tenere's (except the one in NP) show the approximate location of all the tunnels. Over the past month or so I'd been closely watching a thread on Adv Rider where a dodgy sounding bloke called Phreaky Phil was planning a ride taking in the Taranaki Tunnels with a bunch of his mates. Funnily enough this appealed somewhat to this particular moto-bicyclist and I made plans to tag along - I even took a day off work! With the ride starting in New Plymouth I decided to ride up on Friday afternoon and stay at my sister's the night but early on in the week the weather really changed and there was even tornado's in the 'naki! What was it going to be like for us nutters? 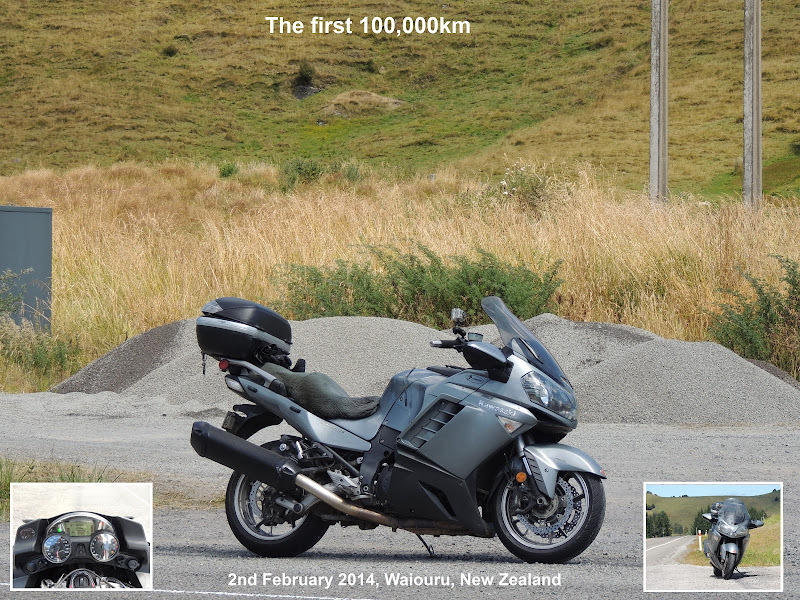 As it turned out Friday wasn't too bad at first, just a few spits riding over to Whanganui. 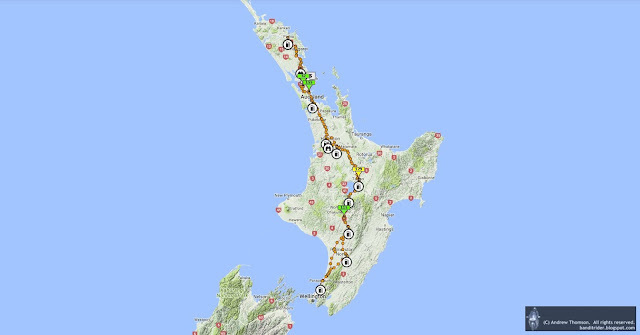 Cruising further on up the road I decided to stop for fuel in Patea and then perhaps do some exploring inland from Hawera/Normanby. Trouble was some bloke had dug up the forecourt of the garage in Patea so no fuel for me. Naturally my low fuel alarm came on not long after Patea so I decided that I'd have to break my usual habit and stop in Hawera for fuel. This ended up being a pretty good idea as it started raining with some vigour just out of Hawera and the fuel stop gave me the chance to put on my wets. I think the rain cleared again not far out of Hawera but I was still glad to be a bit warmer. The narrow country road out to my sisters was a little exciting as it was fairly slippery in places and had all sorts of wreckage sprinkled all over it. My Brother-in-law also failed to run me over with his big tractor too so I was fairly happy about that as I parked up and went in to have afternoon tea with my nephews and niece. 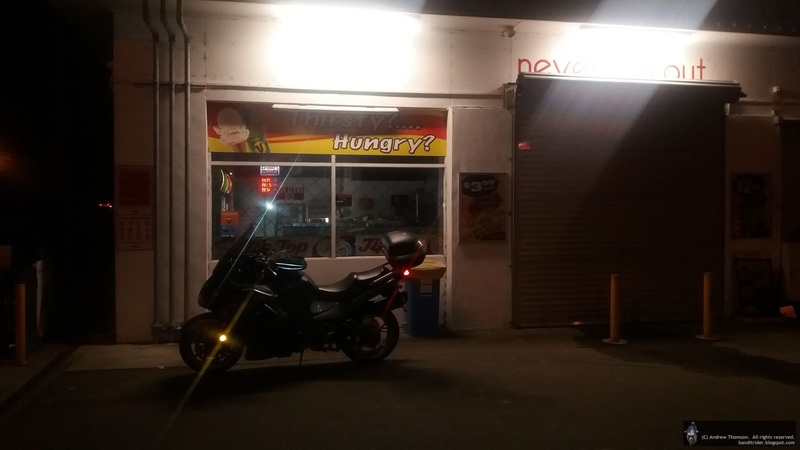 I wasn't quite the first one up in the morning (someone had to milk the cows and it wasn't me) but after a quick brekkie, a sort out of gear and sticking my wets on just in case, I was on my way towards New Plymouth to meet up with the crew. Gassing up, there were already a few keen ones lined up and waiting patiently for the rest to arrive and in the end we must have had nearly 30 of us including some keen pillions. I of course got to meet Phreaky Phil and a lot of others but also managed to catch up with a few of the old BRR crew which was fantastic. Once everyone had arrived and had the chance to say gidday Phil got us under control and gave us the word on the plans for the ride. While a few of us had the route loaded into our GPS's, we also ran the cornerman system and had a TEC - good stuff. Gosh, that's a nice bike! After our refreshments we followed our fearless leader East out of Stratford and took in some more windy sealed roads both on and off the Forgotten Highway until we hit the next bit of gravel on Mangaehu Road. At Makahu and just short of Tunnel number 3 we stopped for another quick regroup.